The Overbay Saga: Black or Red? The ‘L’ word is contentious issue among Blue Jay fans. Blue Jay first baseman, Lyle Overbay, was a player highly scrutinized in Toronto well before this season. Now, Overbay is off to a horrid start hitting .127 AVG, with 0 HR’s and only 4 RBI’s. If you go to some of the daily Blue Jay blogs you will find an ‘all out war’ going on between fans with different opinions on Overbay‘s value. Who knew baseball could resemble war? Seems like the furthest thing from war to me? For Jay fans, Lyle Overbay is the Gaza Strip. In short, the debate stems from Overbay’s ability to play great defense and contribute an above average .OBP (on base percentage) – stats that go relatively unnoticed by casual fans that put high expectations on a first basemen in the catergories of HRs, RBIs and AVG. Overbay’s contribution, or lack there of, is the main dispute. Many Jays fan want him out of the lineup, where some believe him to be a key contributor getting on base and playing stellar defense. I can’t think of a Blue Jay that has been more disputed, criticized and argued more than Lyle Overbay. If you listen to local sports talk radio after Jay games, you will hear a guy named Mike Wilner defend Lyle Overbay on a religious basis. 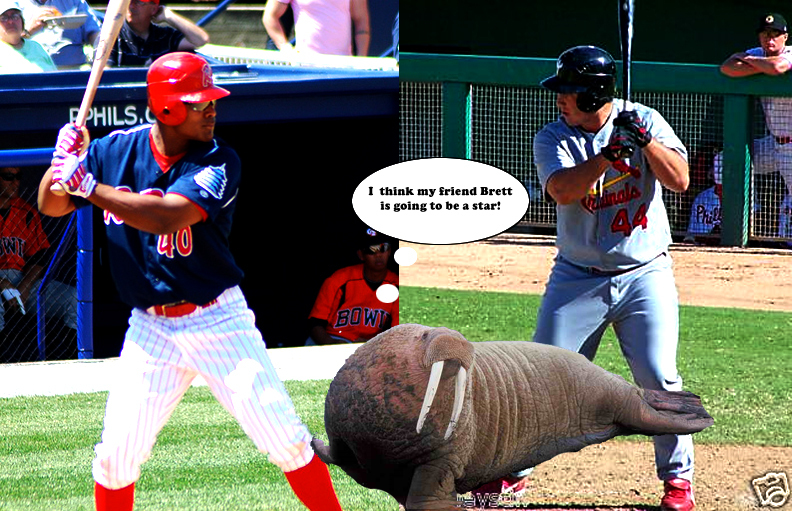 The day Overbay moves on, Wilner will likely feel an empty void in his life. He has preached the Gospel of Overbay for so many years that Lyle must possess some kind of omnipotence in his mind. I enjoy Wilner on the radio, so I hope he doesn’t have a nervous breakdown when Overbay is gone. Any baseball player, as we learned from the book/movie in pre-production starring Brad Pitt and Jonah Hill ‘Moneyball,’ players can be seen as financial commodities. With Overbay it has been hard to tell if we were in the black or the red? It is hard to compare him to other first basemen because he not like the others. Overbay begun his contract with the Jays in fine fashion, but is now ending it in with a less-than-mediocre performance. Are the Jays in the black or the red with Overbay? Answer that question, but be prepared for war! doubles became merely average falling to the low-to-mid 30’s. contract it became apparent those days were over. Considering the numbers previously mentioned for past three years. position for their respective teams. decline from the 7.95 million that he will make in 2010.
first baseman that is just good at getting on base and playing defense? fit into Oakland General Manager Billy Beane’s ‘Moneyball’ philosophy. Overbay in consideration of these factors. to commit to Crawford instead of Pena. signing Overbay next offseason, in my opinion. First of all, I want to apologize to young Jays GM, Alex Anthopolous, for reiterating some of the criticism that has been thrown his way in the offseason. Anthopolous is making HIS moves. Put simply, he is doing what he feels needs to done in order to build the Jays from the ground up. Who am I to say that he is making too many low-risk decisions that resemble the former GM J.P. Ricciardi? I really hope Brett Wallace proves the critics wrong. A funny thing happened last week. It was as if I woke up something in Alex Anthopolous by my last post? AA did something totally beyond what the former management would have done. He took a risk! An exciting risk on one of the top international baseball prosects. 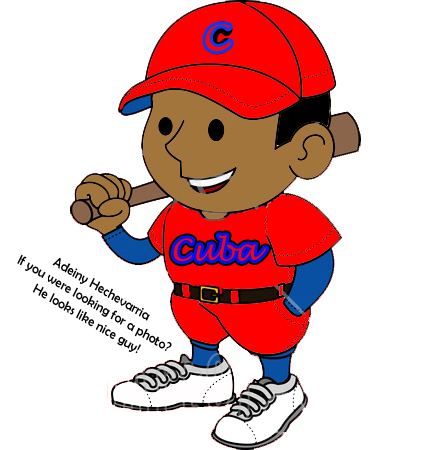 The Jays signed supposedly 19-year-old Cuban infield prospect Adeiny Hechevarria to a 4-year-deal worth 10 million dollars. Even though the Yankees aggressively pursued Hechevarria, and reportedly offered him more money, the Jays scooped him up. The young man expects to move quickly up the ladder in the Jays organization – something that he felt could not be achieved in New York. One scout calls Hechevarria the next Alfonso Soriano, another says that he is more of fielder than a hitter, and then one more scout believes that he eventually be an outfielder. Regardless, Alex Anthopolous is taking a necessary risk in this signing! I like it! Acquiring a young infielder fills a void in our organization, and even if it doesn’t work out, you can tell that AA’s mind is in the right place. He is slinging the guns! Risking money on a young player than can potentially pay ‘HUGE 5-catergory’ dividends! With this move, AA countered the exact thing that I wrote about last week. Using Baseball Prospectus’ evaluation of the Taylor/Wallace trade to comment on how AA dealt a high-reward prospect, Michael Taylor, for a low-reward, one-dimensional guy in Wallace. Hechevarria is definitely the ‘high-risk, high-reward’ move that Blue Jays were looking for, and Baseball Prospcetus was expecting. Hechevarria will likely start the year in AA New Hampshire – an indication that the Jays will REALLY move the guy along. This move has the whole Blue Jay nation up in excitement! All right! Time to get serious about this season, and Jays in the future. Reading ‘Baseball Prospectus‘ I see that Jays GM Alex Anthopolous is already facing critics. Here is a little background on Anthoupolous, and the situation he faces for the upcoming season. become known as ‘AA’ out of conveinence for his large name. up on Beattie the first time he called. they were rated #28 system in baseball. that instantly boosted the rating of the Jays system. Athletics for A’s top prospect Brett Wallace a fatal mistake by AA. naturally gift skill, and having a higher-ceiling. debate among Blue Jay faithful. believe, this deal could definitely backfire HUGE in AA face! Do you agree Billy Beane swindled the Jays by acquiring Taylor for Wallace? Does AA deserve to be ‘ripped on’ for the ‘Taylor/Wallace deal? How important is it to have athletes on your team, as opposed to players that can ‘mash’? The Roy Halladay blockbuster trade to the Phillies a couple months ago has recently brought this blog, my screen name, my life and Toronto Blue Jays into an identity crisis! First of all, there is no way that I am changing my ‘welikeroywelikeroy‘ screen name! 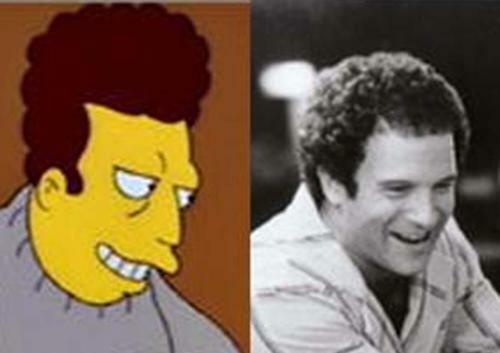 ‘The Simpsons‘ reference coupled with my favorite all-time player’s name is just too good to let go of. Combined with Halladay being my favorite player, this was naturally one of the best screen names that I’ve ever thought of, in my opinion. I even tried to get that chant going at a couple of Blue Jay games, but it never caught on. This is the gift that I give to you City of Philadelphia! Make the ‘We Like Roy’ chant work! I’ve come to realization that I will always be a HUGE Halladay fan, no matter where he goes! And to prove this fact, without completly destroying my identity as a life-long ‘die hard’ Blue Jay fan, I’ve taken a drastic step. That is right! 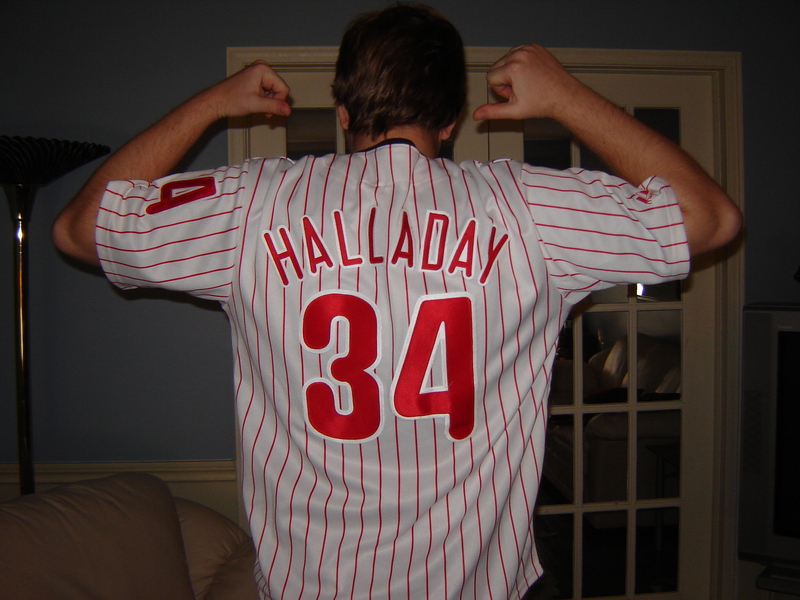 I got a Roy Halladay Phillies jersey, and I wear it proudly, not even being a Phillies fan. 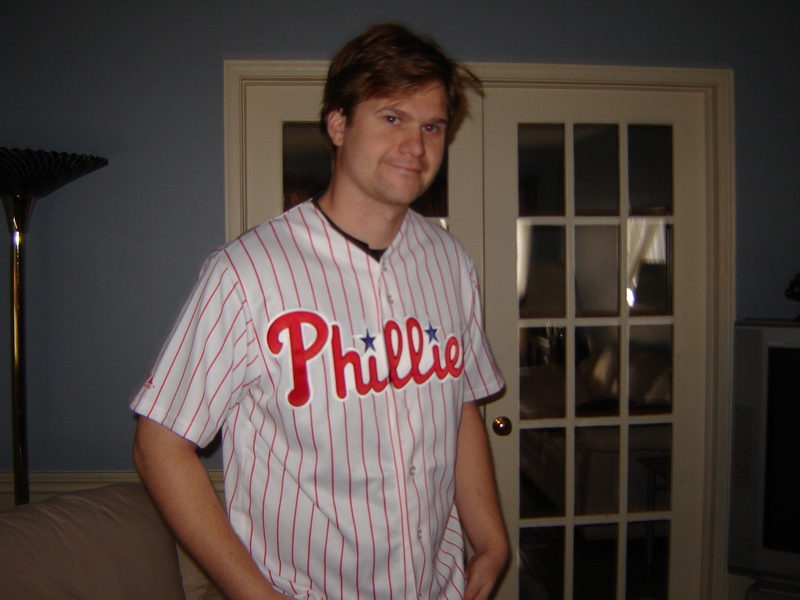 Call me a traitor all you like, but I still wear my Halladay Blue Jay jersey just as proudly. Having this jersey is a statement that I realize the economics/business of baseball, and I have accepted it. Halladay wanted to get paid, and go to a winner. As long as that doesn’t come at the Blue Jays expense, I accept it, and embrace it. From now on, I am a serious Phillies fan when Halladay is pitching. I will be skipping Jay games to see Halladay starts! That is a bold statement for me, but in figuring my ‘identity crisis,’ the loyalty I have towards Halladay partially trumped my loyalty towards the Jays. It had an impact, is all I am saying. My personal ‘Blue Jay world’ was devastated by some kind of natural disaster when the Halladay trade went through … to use a terribly timed metaphor. 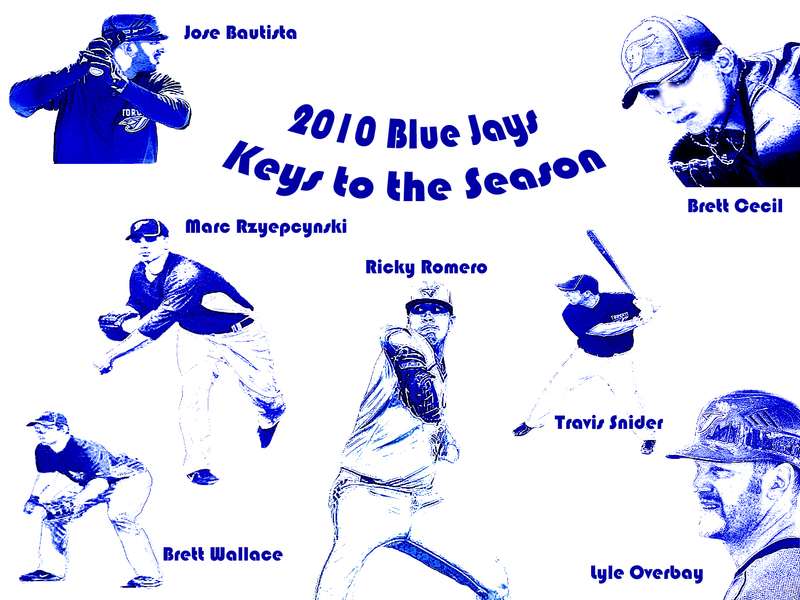 be interesting to see what player(s) round out the Blue Jay ‘identity‘ for years to come. In closing, uncertain in life as I look for steady employment, figuring out my baseball allegiance had to be cleared up before appling to more jobs. I was lost. My life usually follows the condition of the Blue Jays franchise in some eerie way. You’d have to talk to me for examples. Right now, the Jays and I are both searching for an identity. Hear is hoping that we both hope find our identity moving forward. In case you were wondering about the over use of CAPS and the exclaimation marks, Matt Holliday was traded to the St. Louis Cardinals today for promising thrid base prospect Brett Wallace. What relevance does this have to a Toronto Blue Jay fan?? 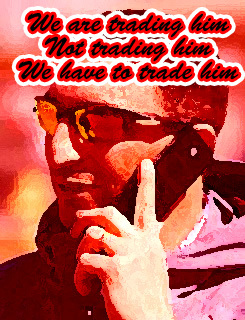 None whatsoever, but it stop some ill informed people from calling in to a Toronto sports radio station and asking, “Who did we get for him?” Obviously confusing Holliday with Halladay. There you have the Toronto baseball fan. Always great comedy. I’m suddenly growing a very bleak outlook on the Jays future. With or without Halladay that is. Recanting on what I posted earlier, trading Halladay is not as BIG MISTAKE of a mistake as I put it earlier considering Halladay will likely leave in 2010 if he Jays aren’t competing. I personally don’t see them competing in 2010, so we pretty much have to pull the trigger on this deal. Extremely sad to say, but true. A bitter, bitter truth that is. I would have liked them to hold onto the Doctor for that year, but now that all this has started in the media – there in no turning back. It is obvious that these trade rumours will not stop until a deal is done. Oh well, I missed my chance to see the Jays in the playoffs when I was 12 years old. What I didn’t know is that I’d still be waiting till I was 27 to see it happen! With Halladay being traded, no doubt that I’ll be waiting past my 30th birthday to see October baseball again in Toronto. Wasn’t it untill last year that the Yankees lost the A.L. East for the first time in 13 years??? Awwwww … poor babies!!! Should have played this whole thing cooler J.P. That is all I have to say to him.